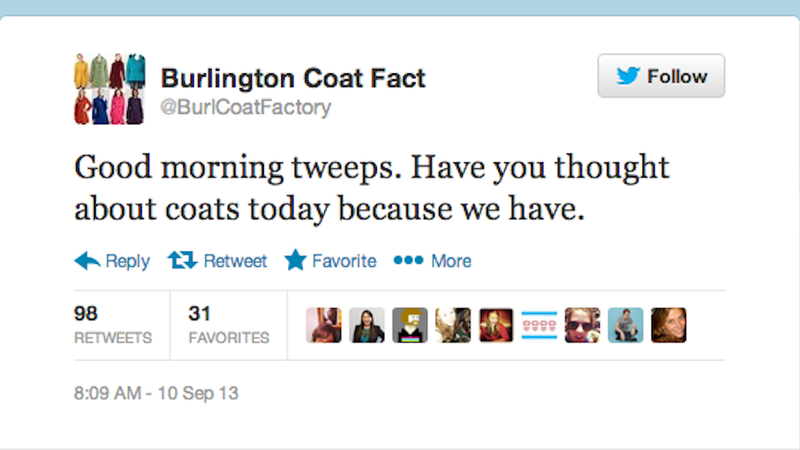 Burlington Coat Factory: they're more than great coats. They're also the namesake of an incredible — albeit probably fake — Twitter feed that's one-third Google Translate misfire, one-third crotchety shopkeeper, one-third corporate Twitter parody, 100% awesome. The Twitter feed wasn't always textbook Weird Twitter; it seems like it started out mildly odd and devolved to full on giddy randomness over the last couple of months. The reason for the change is unclear, but I'd probably open mouth kiss the person responsible for this. After you read these tweets, you probably would, too. UPDATE: Definitely fake, but Burlington Coat Factory should just be quiet and let people think it's real because it makes me more likely to shop there.